Jefferson Davis Futch III, professor of history emeritus, who taught at Washington and Lee University for 46 years until his retirement in 2008, died on Sept. 21, 2017, in Lexington, Virginia. He was 85. Jefferson Davis Futch III. Portrait by Patrick Hinely ’73. Watch the memorial service live on Saturday, Nov. 18, at 2:00 p.m. EST. Futch was born on April 16, 1932, in Baltimore, Maryland, to J.D. Futch Jr. and Mildred Hopkins Futch. He held an A.B. (1955) in humanities and a Ph.D. (1962) in history from Johns Hopkins University. He titled his dissertation “U.S.-German Diplomatic Relations, 1929–1933.” He served as an instructor in history at Johns Hopkins (1956–1957), held a Woodrow Wilson Fellowship (1955–1956), and studied in Italy (1958). He joined the W&L faculty in 1962. He became an associate professor in 1966 and a full professor in 1970. He taught the history of Europe since 1815, of Venice and of the papacy. 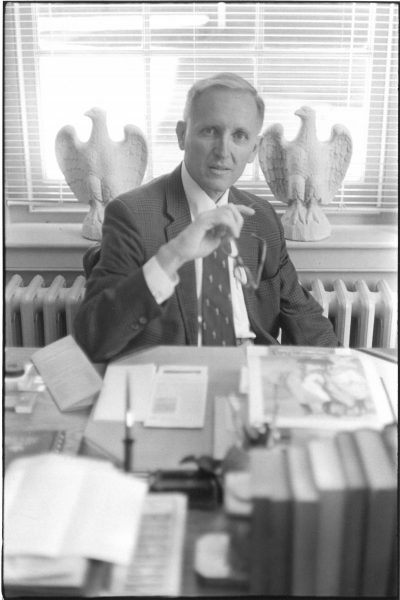 Futch served on W&L’s admissions committee from 1966 to 1969. He belonged to Phi Beta Kappa and the German Honor Society. A long-time contributor to the National Review, Monarche Nuova and Relazioni, Futch also wrote book reviews for the Richmond News Leader, and wrote the preface (in Italian) to an Italian book, “The Conservative Movement in the United States” (1970). He served on the advisory council of Americans Against Union Control of Government and belonged to the American Historical Association and the Society of Italian Historical Studies. Futch was honored by students at a 1973 testimonial dinner, and in 1987 he received the William Webb Pusey Award III for outstanding service and dedication to the university. His retirement in 2008 was even noted in the Congressional Record. Survivors include Barbara C. Bull, of Takoma Park, Maryland, and James L. Forestell, of Reston, Virginia. On Friday, Oct. 6, during Parents and Family Weekend, the Department of History hosted a remembrance of Professor Futch. On Saturday, Nov. 18, at 2 p.m., a memorial service will take place in Lee Chapel on the W&L campus. A reception will follow at the R.E. Lee Hotel. In lieu of flowers, donations may be made to the Dr. Jefferson Davis Futch III Speaker Forum at The Spectator: A Magazine of Student Thought and Opinion.